i'm so grateful for everyone that follows and reads my blog, especially as i'm just a girl from sunderland who decided to post a blog because it's something i'm interested in. i've only finally started getting really into blogging on a daily basis and i thought it was only right to give back for all the attention my blog has received by doing a giveaway. 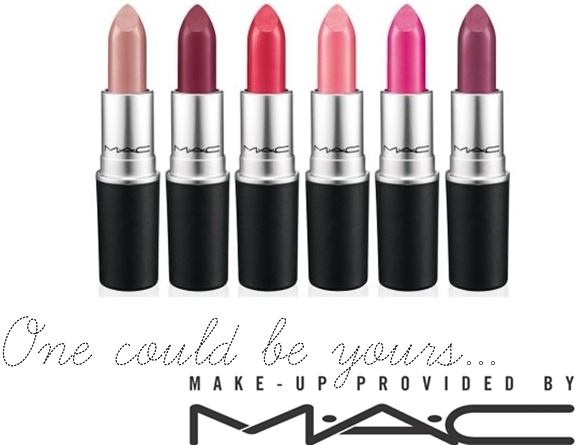 i know it's not much but i will be paying for the product out of my own pocket, but everyone loves MAC lipsticks don't they? the giveaway will run from today until next sunday (11th of november) giving you plenty of time to get yourself in with a chance of winning. remember you must be following to enter. please leave a comment with your name, email, instagram/twitter name (if you chose to follow as an additional entry) and also links if you commented or tweeted about this giveaway. when i announce the winner i will contact them to ask which shade they would like. Hi! I just found your blog from the comment you left on Lily's blog. Looking forward to more posts from you! I really like looking at people wishlists so I'm glad you've been doing those! I really like your blog, and hope you do more wishlists, especially as it's coming up to christmas! I'm a new follower, looking around right now, i liked review posts and that post about watches because I am looking for a perfect watch right now! Aw, im so glad you messaged me about this competition. I love your blog and everything that you post. congratulations, you really deserve it, you have such a great little blog here, its full of personality and you come across as being so lovely. i've just started following, and i can't wait to see all your future posts either. please come over and say hi, i'd love to speak lots more! Thanks for entering my giveaway, great blog! I have followed via GFC, Bloglovin, I left a comment here and tweeted about the giveaway too. I've been following your blog for a long time now and I've always enjoyed it! I'm enjoying your 'wishlist' photo posts with all of the make up products, we have similar taste with make up so I always take your suggestions into consideration. I'd love to see some OOTD posts as I know you dress lovely! lovely giveaway, and that illustration on your banner is amazing... did you draw it? your illustration is AMAZINGG and its soo cool your doing a give away id love to do that ! Congrats on the 100 followers! I know how great it feels to have accomplished something with your blog <3. I thoroughly enjoy your wishlist posts! Just found your blog now, and I love it! Congrats on the 100 followers! I just love the fashion! Your wants are now basically on my christmas list, we have such similar tastes! I have just followed your blog and i literally can't stop reading your posts! I love your fashion posts! I love all your wishlists! So many things i really need now ;) Would love it if you maybe did some outfit posts? Really like your sense of fashion so would love to see how you put it all together! Love your blog, thanks for telling me about this giveaway! I couldn't really say how to improve, keep doing what you're doing! Love your title image, did you do it yourself? Or did you get someone to create the graphics? If so could you forward me the details? I really wish to have something like this on my blog, it looks so funky! Just found your blog and I love it, your banner illustration is so nice! Wish I could draw like that! Well done for getting 100 followers, I've been meaning to do a giveaway like this but forgot to so shall have to wait for the 200 mark now, keep doing what you're doing! A really lovely little blog, i've really anojyed looking through some of your posts!! Great banner and such a lovely blog, deffo entering! great giveaway, so kind of you! I love posts about hauls! Hi! I love your wish lists, and I like that we have a day with new fashions. Love your wishlist and outfit posts! Been following your blog for a while (I'm a tumblr follower haha) and finally logged on to follow via GFC. Enjoy Entertainer Please see the link- Shoutcast hosting. Thanks for this very nice discussion. When choosing a good hosting services for your business lots of things to consider and this blog very well explained it. Continue posting such great information about server hosting. stream host.